Robbin has had an association with the Territory of Nunavut since its inception in 1999 and is strongly committed to creating and improving opportunities for Nunavummiut. For over 15 years, she has met this commitment with integrity and a strong adherence to ethical business practices through her Nunavut based company SILA. As a result, her clients continue to seek her expertise and advice. 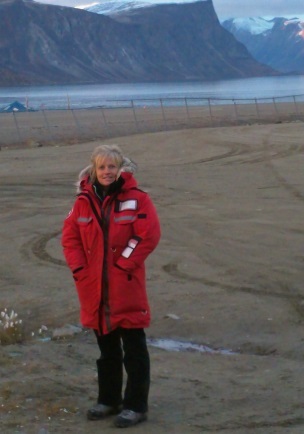 Working with other community members, Robbin was instrumental in establishing a Habitat for Humanity affiliate in Nunavut and Habitat’s most remote northern build which took place in Iqaluit in 2007. Nunavut has not only been Robbin’s place of business but also her home. Through the years, she has worked on several initiatives with a great fervour to make a difference and improve her community. Robbin maintains a residence and office in Iqaluit and continues to make personal and corporate contributions through SILA..
She has recently completed her Masters of Law Degree at Osgoode Hall in Alternative Dispute Resolution in order to provide new insights and skills to assist her clients. By way of Cabinet appointment, Robbin recently became a Council Member of the Nunavut Utility Rates Review Council (URRC). The Council is primarily responsible for the regulation of energy utilities in Nunavut to ensure that the rates charged for energy are fair, just and reasonable. It is also responsible for the oversight for utility operators to provide safe, adequate and secure services to their customers. The Council plays an important role in regulating rates and providing advice to the Minister Responsible and making recommendations on behalf of rate payers. It is a quasi-judicial regulatory body and applies a multi-disciplinary approach involving accounting, economics, engineering and law in its considerations. Robbin has been appointed for a three-year term. Robbin summited Mt. Kilimanjaro on January 6th, 2014 at 2:15 Tanzanian time! 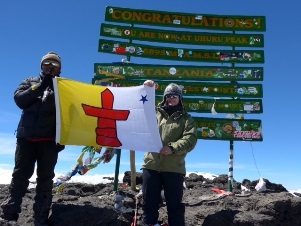 Her climb raised a Nunavut flag on Mount Kilimanjaro ...all in an effort to raise funds and awareness of tuberculosis, COPD and promote good lung health. See Nunavut News/North coverage of Robbin's climb in English and Inuktitut. and chronic obstructive pulmonary disease (COPD). Over June 15 and 16, 2012, Robbin and 3000 others riders completed the charity event - Ride to Cure Cancer from Vancouver B.C. to Seattle Washington, a distance of 240 km. The ride raised over $11 million dollars thanks to all the support provided by friends, family, many corporate sponsors including Sila Management Services and especially the volunteers who made it all come together on the Ride weekend. Robbin’s sense of adventure first led her north at the age of 18 when she traveled through the Yukon on her own. Not afraid of hardships or hard work, Robbin has constantly pushed herself to find new horizons. She applies this drive to everything she does, going the extra mile for her clients and seeking new opportunities to apply herself. 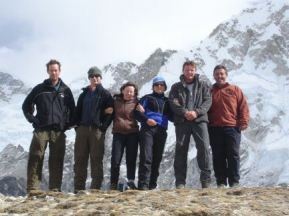 Robbin (third from right) with team members after a successful climb to Everest Base Camp, Nepal in 2008. The Inuktitut word, SILA, was chosen by Robbin for its more traditional meaning of inspiration as it is her desire to inspire others to achieve their potential and, by offering her time and expertise, help them to realize their goals. SILA was created from this vision and reflects Robbin’s values of commitment and integrity and is a true reflection of her adventurous spirit. 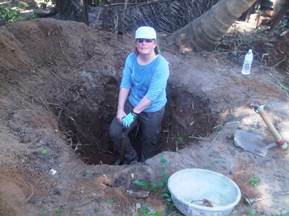 In 2011, she travelled to Pondicherry, India to take part in a Habitat build. She is pictured to the left digging a foundation support for a new home. 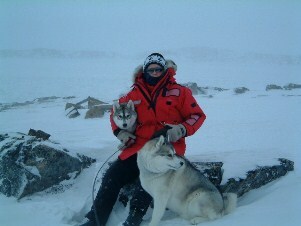 Robbin with her Siberian Huskies outside Iqaluit, Nunavut. SILA provides strategic consulting services specializing in financial analysis, economic development feasibility assessment, professional training and marine operations, focusing on Canada’s North. For a complete listing of our service brochures and newsletters, please follow the link to our communications page and follow us on Facebook.